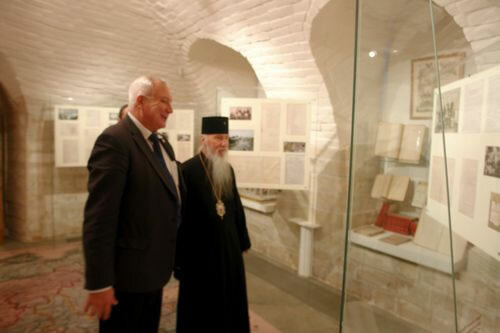 On January 30, 2014, His Eminence Archbishop Mark of Berlin and Germany of the Russian Orthodox Church Outside of Russia, Overseer of its Russian Ecclesiastical Mission in Jerusalem, visited the Museum of the Imperial Orthodox Palestine Society. Vladyka Mark was recently invited to the newly-opened museum, where he viewed the exponents in its four halls, representing the history and contemporary activities of the IPPO. 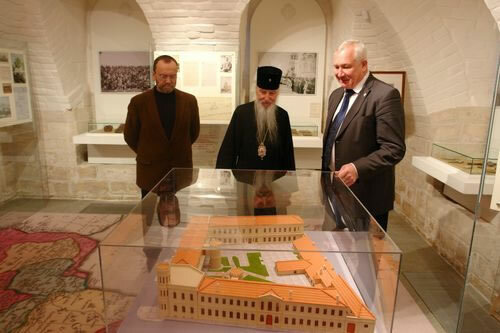 Mr Yuri Grachev, Vice President of the IPPO, and Mr Grigory Manevich, Museum Director, told Archbishop Mark about the exhibits and the creation of the museum. Mr Grachev proudly showed him models of Jerusalem’s Sergiev Posad and the Podvorie of the IPPO in Bari, Italy. In the reception hall, Vladyka Mark viewed an exhibition of paintings of Vladimir Nikonov, celebrating the 150th anniversary of the birth of Holy Grand Duchess Elizaveta Feodorovna. She had headed the Palestine Society from 1905-1917, and after her canonization has been venerated as the heavenly protectress of the IPPO. Mr Sergei Stepashin, President of the IPPO, congratulated Vladyka Mark on his namesday and gave him a Gzhel porcelain souvenir bearing the symbol of the IPPO. Together with Mr Grachev, they discussed ongoing affairs of the two Palestine Societies in the Holy Land. The Orthodox Palestine Society in the Holy Land, established by several members of the IPPO, were forced to flee Russia after the events of 1917, and tried to preserve the legacy of the IPPO in the Holy Land. The Imperial Orthodox Palestine Society, continuing its existence in the homeland to this day, is offering cooperation in light of an agreement signed in 2007. In 2009-2010, a grant from Russky Mir enabled a project aimed at teaching Russian language in the Orthodox School of Bethany for girls under the auspices of Archbishop Mark. This is the only school in Palestine today that teaches Russian.